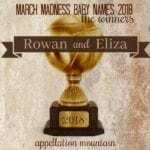 March Madness Baby Names 2019: The Winners! 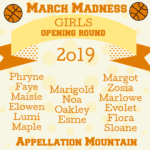 March Madness baby names 2019 has drawn to a close, and it’s time to announce the winners. 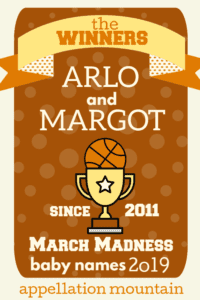 Please join me in congratulating Arlo and Margot, the newest members of our March Madness baby names’ champions circle. The girls’ Mar match-up ended with Margot besting Marigold, almost 60% to just-over-40%. Marigold competed in 2018’s final, too – and lost that contest by an even narrower margin. At last, Arlo takes the prize, with nearly 62% of the vote, versus Torin, which scooped up 38%. 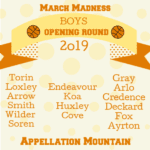 If you’ve been following March Madness baby names, you might know that this was Arlo’s third year in the final contest. Arlo lost to Leo in 2017 and Rowan in 2018 – but I guess it’s true that the third time’s the charm! You’ll note that Cora defended the title in 2015; after that happened, all past March Madness baby names champions were disqualified from future contests. 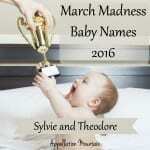 In the ninth year of competition, it’s fair to say that there’s a definite style for March Madness baby names winners. They’re familiar, but not Top 25. (Or even 100, at least not at the time of the contest.) They’re often names on the upswing, rising in use in the following years. And even though some wild, out-there names always appear in the opening rounds, that’s never where the contest ultimately takes us. The names that win feel like crowd-pleasers – and I guess that makes sense. This year’s pair feels even closer than some. They share a strong ‘ar’ sound and that bright, upbeat ‘o’ ending. In fact, they’re probably a little too close for sibling names. Our tenth year of competition kicks off on Saturday, March 7, 2020. 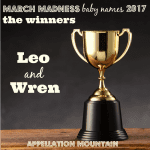 Between now and then, we’ll have more contests – the fourth annual New Names Showdown in July; October’s third round of the Great Halloween Baby Names contest; and a second edition of the Favorite Celebrity Baby Names contest to round out the year! Congratulations Arlo and Margo! If I named a boy and a girl from all our winners I think I’d go with Archer and Genevieve. My son knows half a dozen Arlos all his age. He’s almost three. It’s pretty trendy here in New Zealand, it’s even in the top ten. It feels like the next Jackson to me. Ooh, I like both of these so much and was hoping Margot would win. I almost never back the winner in these contests so this is exciting!